Activation of the phosphatidylinositol 3-kinase (PI3K) through mutational inactivation of PTEN tumour suppressor gene is common in diverse cancer types, but rarely reported in gastric cancer. Recently, mutations in PIK3CA, which encodes the p110α catalytic subunit of PI3K, have been identified in various human cancers, including 3 of 12 gastric cancers. Eighty percent of these reported mutations clustered within 2 regions involving the helical and kinase domains. In vitro study on one of the "hot-spot" mutants has demonstrated it as an activating mutation. Based on these data, we initiated PIK3CA mutation screening in 94 human gastric cancers by direct sequencing of the gene regions in which 80% of all the known PIK3CA mutations were found. We also examined PIK3CA expression level by extracting data from the previous large-scale gene expression profiling study. Using Significance Analysis of Microarrays (SAM), we further searched for genes that show correlating expression with PIK3CA. We have identified PIK3CA mutations in 4 cases (4.3%), all involving the previously reported hotspots. Among these 4 cases, 3 tumours demonstrated microsatellite instability and 2 tumours harboured concurrent KRAS mutation. Data extracted from microarray studies showed an increased expression of PIK3CA in gastric cancers when compared with the non-neoplastic gastric mucosae (p < 0.001). SAM further identified 2910 genes whose expression levels were positively associated with that of PIK3CA. Our data suggested that activation of the PI3K signalling pathway in gastric cancer may be achieved through up-regulation or mutation of PIK3CA, in which the latter may be a consequence of mismatch repair deficiency. The phosphatidylinositol 3-kinase (PI3K)-AKT signalling pathway is involved in the regulation of diverse cellular processes, including cell growth, survival and motility. Abnormal activation of this pathway is frequently observed in various cancer types, leading to aberrant cell cycle progression, altered adhesion and motility, inhibition of apoptosis and induction of angiogenesis . It has been previously reported that genetic alterations involving various members along this signalling pathway could lead to its activation in cancer. These include mutation, allelic loss or promoter methylation of the negative regulator PTEN ; or alternatively, chromosomal amplification or over-expression of the positive regulators PIK3CA [3–5] and the various AKT kinases [6, 7]. Furthermore, changes in other related pathways that are commonly altered in cancer, such as those involved in growth factor stimulation via the G-protein-coupled receptors or through direct interaction with the activated form of small GTPase RAS, can also lead to PI3K-AKT pathway activation . Activation of this pathway results in the phosphorylation of AKT at Thr-308/309 and Ser-473/474. These phosphorylated forms of AKT proteins have been detected by Western blot or immunohistochemistry in various cancer types, suggesting the frequent activation of PI3K-AKT pathway in the carcinogenic process [7, 9]. Although genetic changes along the PI3K-AKT pathway have been repeatedly documented in brain, ovarian, endometrial, breast, prostate and thyroid cancers [1, 2], reports on its mechanism of activation in gastric cancer are limited. Gastric cancer is the second most common cancer worldwide but its molecular basis of tumourigenesis is still poorly understood. Previous immunohistochemical study has demonstrated the presence of the phosphorylated form of AKT in 78% of gastric cancer , suggesting that activation of this pathway may also be common in gastric cancer. Though loss of heterozygosity (LOH) involving the PTEN locus has been demonstrated in 47% of gastric cancer in a recent study, mutation or promoter methylation was absent even in cases with LOH . Thus data from this study could not support the two-hit inactivation of PTEN in gastric cancer, while the biological significance of PTEN haploinsufficiency remains controversial. Alternatively, amplification of AKT1 has been reported in a single case of gastric cancer , and amplification of PIK3CA associated with elevated mRNA levels has been found in 36% of gastric cancer . More recently, Samuels et al. screened a diverse spectrum of human cancers for mutation in 16 PI3K or PI3K-like genes and found a high frequency of somatic mutation in PIK3CA, which encodes the p110α catalytic subunit. Major screening in colorectal cancer (CRC) identified PIK3CA mutations in 74 out of 234 (32%) cases, while mutations were also noted in 3 out of 12 (25%) gastric cancers. Reported mutations were mostly of missense type, and clustered within 2 regions in the helical and kinase domains. Expression of a "hot-spot" mutant, H1047R, conferred a significant up-regulation of lipid kinase activity of PIK3CA, suggesting it as an activating mutation . In this study, we have examined a series of 94 human gastric adenocarcinomas for PIK3CA mutation. We have also examined PIK3CA expression level by extracting data from a large-scale gene expression profiling study previously performed for these cases [14, 15]. Using SAM, genes with significant correlating expression with PIK3CA have also been identified. DNA samples used for sequencing were prepared from frozen tumour and non-tumour gastric mucosae from 94 gastric cancer patients who underwent gastrectomy in the Department of Surgery, Queen Mary Hospital, The University of Hong Kong, as previously described . Majority of the frozen samples (n = 81) showed tumour component of over 70%, whereas in 13 cases a lower proportion between 50 to 70% was accepted due to the tumours' inherent diffuse infiltrative nature with entrapment of non-neoplastic components. Analysis for microsatellite instability (MSI), BRAF and KRAS mutation have been performed and reported previously . RNA preparation and gene expression profiling using a cDNA microarray containing 44,500 cDNA clones, representing around 30,300 unique genes, has been performed and reported in 90 of these tumours in comparison to 22 non-tumour gastric mucosae [14, 15]. This study was approved by the Ethics Committee of the University of Hong Kong. Mutation screening of PIK3CA was performed for exons 9 and 20, covering the mutational hotspots; and for exon 18, from which a mutation was found in a gastric cancer. Mutations in these 3 exons constituted 80% of all PIK3CA mutations detected in the previous study . PIK3CA intron-specific external amplification primers and internal sequencing primers were designed according to the previous study  with some modifications [see Additional file 1]. In particular, primers for exon 9 have been modified to avoid amplification of homologous sequences located in other chromosomes. PCR products were generated using the external primers and directly sequenced using the internal primers with the DYEnamic™ ET Terminator Cycle Sequencing Kit (Amersham Biosciences, Freiburg, Germany) according to the manufacturer's instruction. Electrophoresis was performed in the ABI Prism® 3700 DNA Analyzer (Applied Biosystems, Foster City, CA, USA). For each exon, PCR products were generated from 2 independent PCR reactions for sequencing of the forward and reverse strands. For exon 9, 2 independent PCR followed by sequencing of the forward strand were performed. Analysis of the chromatograms was performed using the mutation analysis software Mutation Explorer™ (SoftGenetics, State College, PA, USA). Gene expression data were extracted from the microarray database containing 126 samples (90 gastric cancers, 14 lymph node metastasis and 22 non-tumour gastric mucosae) based on a 3-fold signal above background ratio for either channel and with 80% good data . Gene expression data from 20,336 cDNA clones satisfied this selection criteria and were extracted, which included a cDNA clone corresponding to PIK3CA (IMAGE clone number 345430, GenBank accession no. W72473). Expression data for PIK3CA was extracted and the differences in expression levels between tumour and non-tumour tissues were examined using the Student's t-Test. SAM was performed to identify genes with significant correlating expression with PIK3CA . The missing values in the dataset were estimated by a K-nearest neighbours impute algorithm using 10 nearest neighbour  followed by 5000 permutations in the SAM analysis. Among the 94 gastric adenocarcinoma analysed, we have detected PIK3CA mutation in 4 cases. Two cases harboured the mutation A3140G (H1047R) in exon 20, and the other 2 cases with mutations G1624A (E542K) and G1633A (E545K) in exon 9. Representative sequence chromatograms are shown in figure 1. All four mutations were absent in the corresponding non-neoplastic mucosae and thus were confirmed as somatic mutations. Though the overall mutation frequency (4.3%) was lower than that of the previous study, the nature of the 4 mutations found were consistent with those identified at the reported hotspots. In particular, the H1047R mutation has been reported in 2 gastric cancers and 15 colorectal cancers . While the E542K and the E545K mutations were not found in gastric cancer in the previous series, a large number of colorectal tumours did harbour these 2 mutations. Representative sequence chromatogram. (a) Sequence chromatogram from a case of gastric cancer with H1047R (A3140G) mutation within exon 20 of PIK3CA. 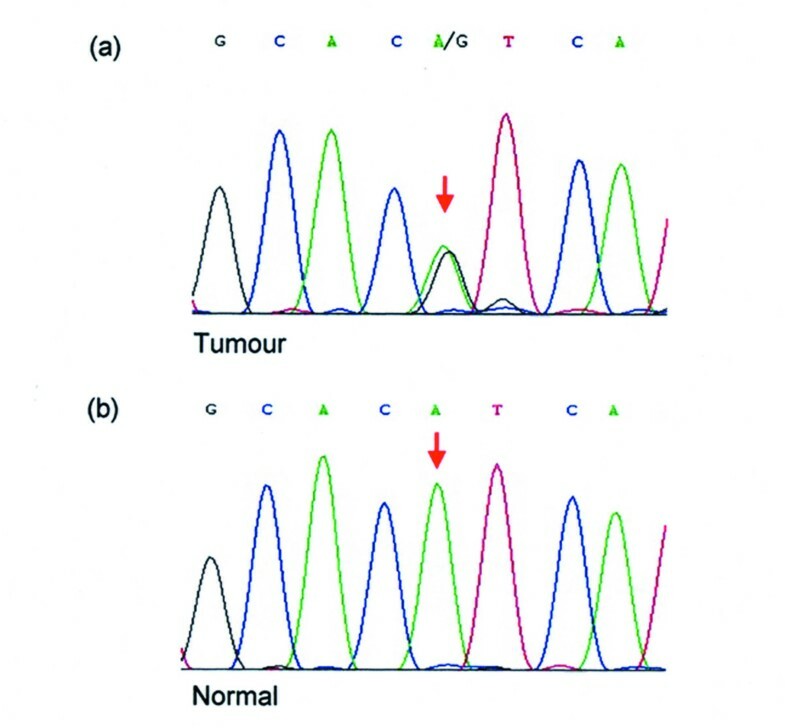 Site of mutation is denoted by the red arrow. (b) Sequence chromatogram of the corresponding normal mucosa from the same case showing the absence of mutation (red arrow), and thus confirming the somatic nature of the mutation. PIK3CA mutation spectrum and their corresponding clinico-pathological features were listed in Table 1. We noted a higher tendency of high-level MSI in gastric cancers with PIK3CA mutations (3 in 4, 75%) than in those without (18 in 90, 20%). Moreover, though the overall incidence of KRAS mutation in the studied population was low (8 in 94), 2 of the 4 gastric cancers with PIK3CA mutation also harboured a KRAS mutation. Since over-expression of PIK3CA has been reported in gastric cancer , we have also extracted PIK3CA expression data from our previous cDNA microarray study of these cases [14, 15]. We have confirmed that expression level of PIK3CA was significantly higher in gastric cancers (n = 87, mean = 0.099, SD = 0.428) when compared with non-neoplastic gastric mucosae (n = 22, mean = -0.418, SD = 0.426; Student's t-Test, p < 0.001). Using PIK3CA expression level as a continuous variable for SAM analysis , we found 2910 cDNA clones (corresponding to about 2546 unique genes) whose expression associated positively with PIK3CA expression (median number of false significant = 0.372, Delta = 1.107) [see Additional file 2]. Interestingly, no gene was found to be negatively associated with PIK3CA expression. In this study, we have reported the presence of PIK3CA gene mutation in 4.3% of gastric cancer. A high tendency (3 in 4) of mismatch repair deficiency was noted in cases harbouring PIK3CA mutation. Though the small number of PIK3CA mutations in our study may not justify statistical claim of significance; suggestion of such, despite of its not being mentioned by the authors, can be found from a previous study in CRC by Samuels et al.. From their study of 33 MSI and 201 microsatellite stable (MSS) CRC cases, PIK3CA mutation was present in 48% of the MSI tumours, but only in 29% of the MSS tumours. A significant association would have been revealed if statistical analysis had been applied (Fisher's exact test, p = 0.014) . Gastrointestinal tract cancers with MSI are known to have a different molecular pathway of tumour evolution compared with their MSS counterparts [19, 20]. This can be attributed to their propensity for frameshift mutations in repeat sequences, resulting in selective disruption of genes with such sequences within their coding regions. With 2 poly-adenine tracts within its coding region, PTEN can be inactivated through frameshift mutations in MSI CRC, resulting in the selective targeting of the PI3K-AKT signalling pathway [21, 22]. It is also known that mismatch repair deficiency would lead to an elevated rate of missense mutation due to impaired single nucleotide mismatch repair . Thus, the observed higher incidence of PIK3CA missense mutation in MSI colorectal and gastric cancers suggests yet another mechanism for the activation of the PI3K-AKT signalling pathway through mismatch repair deficiency. Our data also showed a higher tendency of KRAS mutation in cases with PIK3CA mutations (2 in 4) than in those without (6 in 90). Yet again due to the low incidence of both mutations in our samples, statistical significance may not be claimed. In the study by Samuels et al., some of the colorectal tumours with PIK3CA mutation also harboured KRAS or BRAF mutation . The PI3K-AKT pathway is known to have a close association with the RAS-MEKK signalling pathway . Constitutively active RAS can interact with the catalytic subunit of PI3K and lead to its activation. Ras-dependent PI3K activation contributes to the transforming phenotype by mediating anchorage-independent growth, cytoskeletal reorganisation and apoptosis evasion. It has been observed that genes involved in the same signalling pathway may manifest mutations in cancer cells in a mutually exclusive manner, presumably due to the lack of selective growth advantage in having a second hit in the already altered pathway. A prominent example is the mutually exclusive occurrence of the BRAF hotspot mutation (V600E) and KRAS mutations in colorectal cancer [24, 25]. However, there exist other examples of alterations in multiple components of the same signalling pathway that may lead to a multi-level modulation of its activity. For example, non-V600E BRAF mutations tend to occur together with KRAS mutations , and inactivation of the secreted frizzled-related proteins (antagonists of WNT) by promoter methylation frequently coincides with mutations in the Adenomatous Polyposis Coli gene to achieve multi-level activation of the WNT signalling pathway in colorectal cancers . Whether PIK3CA functions independently from RAS, or acts synergistically with RAS to produce additive effects on the activation of the same pathway awaits further clarification. By extracting data from microarray, we have confirmed the up-regulation of PIK3CA expression in gastric cancer tissues compared with the non-neoplastic gastric mucosae and identified a large number of genes that showed a significant positive correlation in expression level with PIK3CA. These genes participate in diverse cellular processes with 177 as putative cell cycle-regulated genes  and 126 mapped to genes with known functions in cell cycle regulation, cell proliferation or DNA replication [see Additional file 2]. While some of these genes maybe induced by PIK3CA, others maybe co-ordinately regulated by common upstream signals. Expression data set at one point was limited in differentiating the above cause and consequence, yet it certainly revealed the complexity of the carcinogenic process and the intricate relationship of PIK3CA signalling with other cellular processes. Contrary to our expectation, the incidence of PIK3CA mutation found in the current study (4%) is much lower compared with that observed by Samuel et al. (25%) . The reason for discrepancy may simply be a result of sample bias as the previous study involved only a small number of gastric cancers (n = 12). However, ethnic differences can also be another possibility. The diverse pathological spectrum and aetiological factors of gastric cancers in different geographical locations may be paralleled by differences in molecular pathway of tumour development. Since our current study is only based on a Chinese population with an intermediate gastric cancer incidence, further studies involving patients from different ethnic groups will be able to address this possibility. Large-scale screening of gastric adenocarcinomas for PIK3CA mutations revealed a mutation incidence of 4.3%. Increased PIK3CA expression level was observed in gastric tumours compared with non-neoplastic mucosae. This increase in PIK3CA level was associated with the elevated expression of a large number of genes, which may constitute the upstream regulators or downstream targets of PIK3CA along the PI3K signalling pathway. This work was supported by the Research Grants Council of the Hong Kong Special Administrative Region, HKU 7313/02M. VSWL carried out the molecular analysis, performed data analysis and drafted the manuscript. CWW, TLC, WZ assisted in the molecular analysis. KMC provided the clinical data. ASWC assisted in data analysis and edited the manuscript. SS and XC participated in the microarray study and data analysis. STY and SYL conceived of the study, participated in its design, coordination and data analysis, and edited the manuscript. All authors read and approved the final manuscript.